Pinterest ads, also known as Promoted Pins, are an outstanding way to drive an engaged audience of targeted, eager buyers to your website. With over 200 million active users logging on to the platform each month, Pinterest can no longer be ignored as a place to promote your business or blog. Before we dive into Pinterest ads, I want to invite you to sign up for my Pinterest Traffic Masterclass. You’ll get a behind-the-scenes look at how I use Pinterest ads (along with 2 other powerful strategies) to generate consistent traffic to my website and email subscribers onto my list. I’ll show you how to replicate my strategy so you can get more traffic and email subscribers in less time! You can sign up for the free Pinterest Traffic Masterclass using the form below. To make sure we’re all on the same page, let’s begin with a brief explanation of Pinterest ads and Promoted Pins. What are Pinterest Ads and Pinterest Promoted Pins? Pinterest allows people to search and discover ideas, content, and products using images and videos. Each image on Pinterest is called a Pin. The image below is a screenshot from my Pinterest home feed. Each image is a Pin that links to a unique URL – typically a blog post, landing page, or sales page. Pinterest ads are Pins (images) a business pays to be shown where their target customer will likely find it. This is why Pinterest ads are called Promoted Pins. 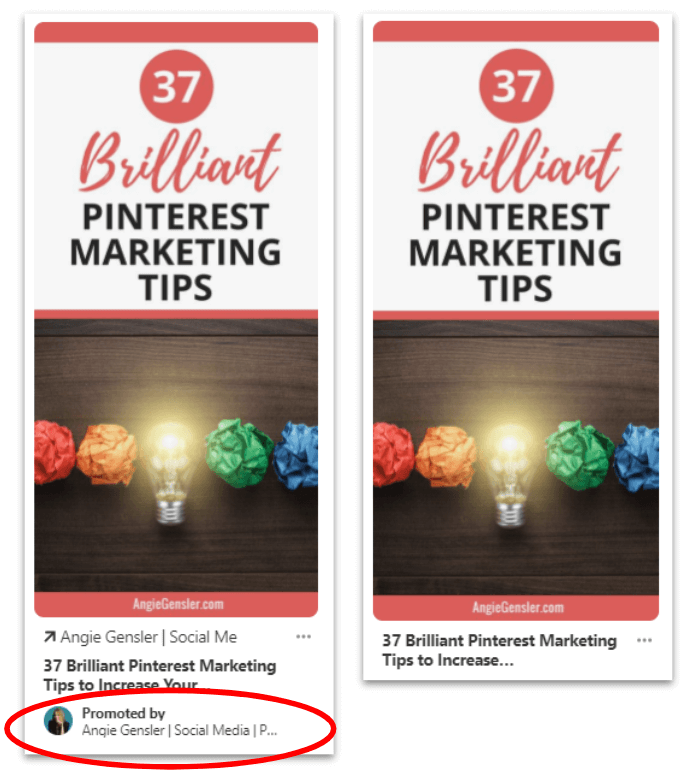 A Promoted Pin is a paid ad on Pinterest. The terms Pinterest ad and Promoted Pin can be used interchangeably. Promoted Pins look and act like regular Pins on Pinterest. The only difference is they say “Promoted by (insert name of company)” at the very bottom of the Pin. Take a look at the example below of one of my Pins that I turned into a Promoted Pin. The image on the left is what the Pin looks like in the feed as a Promoted Pin and the image on the right is what it looks like in the feed as an organic Pin. 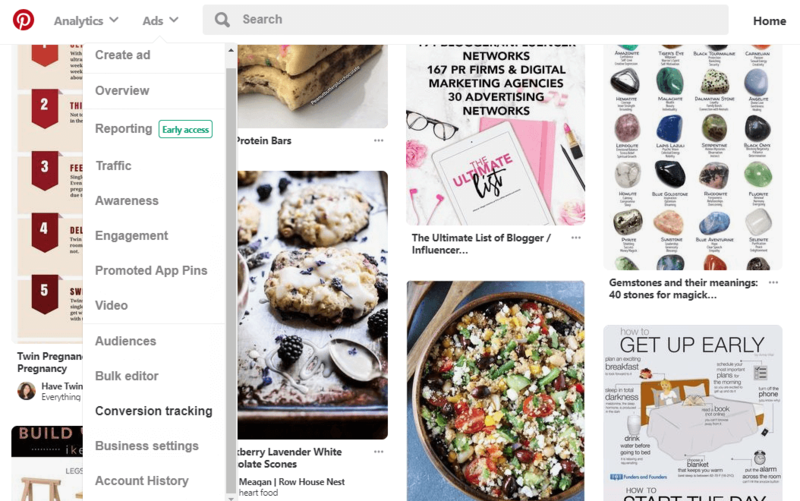 Whether you’re scrolling through your home feed or you used the search bar to look for something specific, you’ll see that Promoted Pins (Pinterest ads) are peppered throughout the feed. There are four Promoted Pins In the first screenshot I shared above, but I bet you didn’t notice them. Pinterest does a fantastic job of working Pinterest ads seamlessly into the user experience. To help you find all four Promoted Pins, I’ve outlined them in red in the image below. Now that you know what Pinterest ads and Promoted Pins are, let’s move on to why your business should advertise on Pinterest. There are six main reasons your business should advertise on Pinterest, but to be clear, Pinterest is not the right platform for every business. If you’re not sure if Pinterest is right for your business, read: Is Pinterest Right for My Business: 14 Niches Perfect for Pinterest. Let’s move on and assume that Pinterest is the right fit for your business and its where your ideal customer hangs out. Why should you spend your precious dollars advertising on Pinterest? 1. Pinterest is a growing platform. And that number is an increase of approximately 40% over the previous year* which means Pinterest is a growing platform. 2. Pinterest Users are Motivated Buyers. According to a 2017 Pinterest study, 72% of Pinners say Pinterest helps them find ideas for everyday life. Compare that to other platforms like Facebook, where users are primarily on the platform to engage with friends and family, not to find ideas and engage with brands. This means Pinterest users are on the platform actively looking for ideas and products to buy and they have money to spend! 3. Early Influence in the Buying Decision Process. According to the same study mentioned above, 97% of search terms on Pinterest are unbranded. This means you have an amazing opportunity to reach customers early in the buying decision process and before they have committed to a particular brand or company. 4. Pinterest Ads are Easier to Create. While there are a lot of tricks to optimize the performance of your Pinterest ads and reduce ad cost, it’s fairly easy to create your first Pinterest ad campaign. The Pinterest Ads Manager is not nearly as complicated as other ad platforms. With a little training and guidance from a Pinterest Ads expert, most people can learn how to create successful ad campaigns in a matter of hours. Other paid ad platforms like Google or Facebook often require years of experience and testing or a professional ads manager in order to build successful ad campaigns. Pinterest ads also tend to be much more affordable than other types of online ads. Earlier this year I ran ads on Pinterest and Facebook for my Social Media Content Calendar. The image below shows the comparison between my Pinterest ads (top graph) and Facebook ads (bottom graph). I set a budget of $250 for each platform and ran the ads to similar audiences with similar objectives. The Pinterest ads generated 247 more clicks than the Facebook ads because each click from Pinterest cost me 13 cents less than clicks from Facebook! Where would you rather place your precious ad dollars? 6. You Don’t Pay for Earned Engagement. This final reason your business should advertise on Pinterest is by far the most exciting part of Promoted Pins! When someone saves your Promoted Pin to their own board it’s saved as the organic version of your Pin and it continues to live on long after your campaign has ended. If that Pin gets additional clicks and repins, you don’t pay a single penny for that activity. This is called earned engagement and it’s completely free. Woot, woot! Look at the screenshot below showing the analytics from an ad campaign I ran that ended about 6 months ago. Even though this campaign ended months ago, in the past 30 days this Pin has received 109 FREE impressions. That’s the amazing power of Pinterest ads! Now that you understand why you need to advertise on Pinterest, let’s walk through how to advertise on Pinterest. There are a few things to know before you create your first Pinterest ad. First, you cannot run ads from a personal account which means you must have a business account. 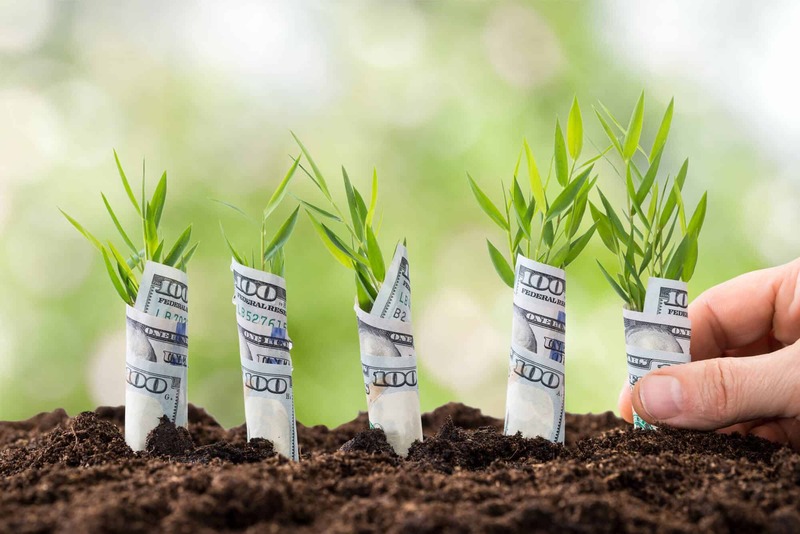 If you don’t have a business account, you can either convert your personal account into a business account or you can create a brand new business account. There are a number of factors to consider when deciding whether or not to convert your personal account into a business account so please watch the video below before you make that decision. The second thing you need to know before creating your first Pinterest ad is that ads are only available in six countries: United States, Canada, United Kingdom, Ireland, Australia, and New Zealand. Additionally, Pinterest ads can only be shown to people who live in those countries. If your target audience does not live in one of the six countries listed above, Pinterest ads are not a viable option for your business. And finally, before you can create a Promoted Pin, you must first add that Pin to one of the boards on your account. Pinterest does not allow you to upload a new Pin inside the ads manager platform. You must select a Pin that already exists on your profile. For tips on how to design high-performing Pins, read: How to Create Stunning Pinterest Images That Go Viral. 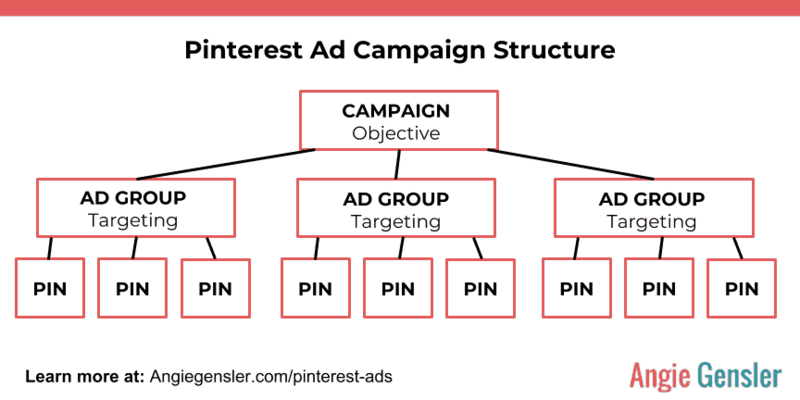 Before you create your first Pinterest ad, It’s also important to understand how Promoted Pin campaigns are structured. Similar to Facebook ads, Pinterest ads are structured into three levels. The first and highest level is the campaign. The campaign houses all the ad groups and Pins (ads). The campaign level is where you select your objective or goal for the campaign, set your budget, and choose the ad placement. The next level is the ad group. The ad group level is where you select the targeting parameters for your ads such as keywords, interests, and demographics. You can have multiple ad groups within a campaign. The third and final level is the Pin or ad. The Pin level is where you select the actual Pin image you want to promote. You can have multiple Pins within an ad group. Now that you understand how Pinterest ads are structured, let’s talk about the different types of Pinterest ads you can create. There are four different types of ads you can run on Pinterest and the type of ad you choose will depend on the ultimate goal of your campaign. Unless you’re a large brand with a large budget, I do not recommend selecting the brand awareness objective. I personally only run traffic campaigns and I recommend the students in my Pinterest Traffic Trifecta course to do the same. Once you’ve selected the type of campaign you want to run, you’ll need to select who you want to target. 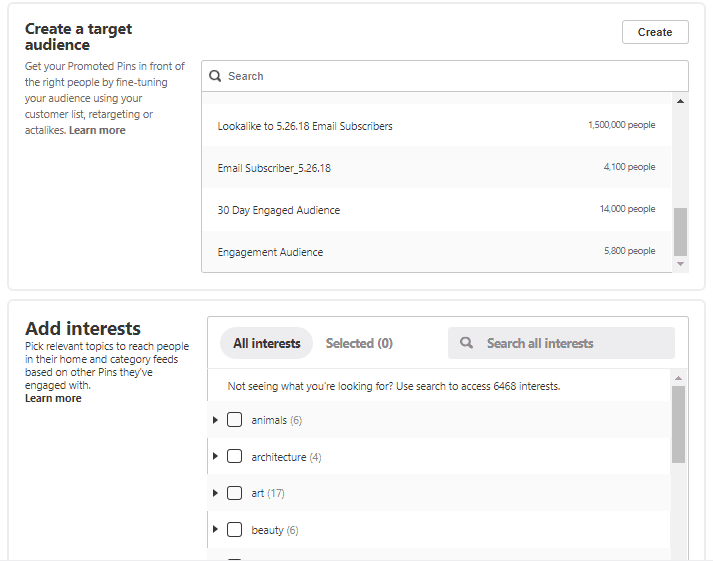 Targeting is set in the ad group level and it’s where you should spend the majority of your time and effort when building a Pinterest ad campaign. Pinterest Ads Targeting: How Does it Work? There are a variety of ways you can target Pinterest ads to reach your ideal customer. First, you can select where you want your ads to be placed. You can choose your ads to be placed in the home feed (called browse ads) in the search results (called search ads) or both. PLEASE NOTE: Ad placement is selected at the campaign level and cannot be customized by ad group. Read the 5 best practices toward the end of this article for more information. If you want your ads to show up while people are browsing their home feed, you can target custom audiences or interest groups. If you choose to target by interests, Pinterest will show your Pin in the feed of anyone who has engaged with Pins related to that specific interest. There are literally thousands of unique interests you can target. 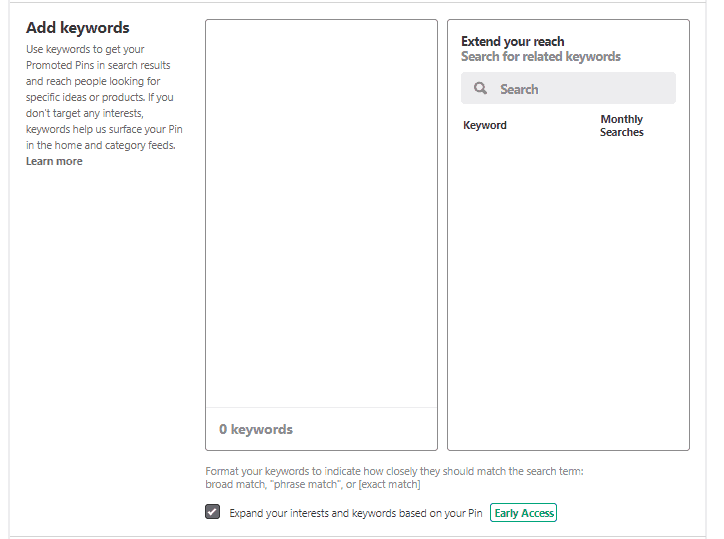 If you want your ads to show up in the search results for specific search terms, you can target by keywords. Pinterest search ads are a fantastic way to get your content in front of an engaged audience actively searching for your product or service. I’ve found search ads to perform extraordinarily well and, depending on your niche, they tend to be more affordable than browse ads. Pinterest also allows you to target by location, language, device, and gender. Once you’ve finished adding your targeting parameters, Pinterest will provide you with a suggested strong bid. The bid type varies depending on the type of ad you choose so let’s dive into how much Pinterest ads cost. How Much do Pinterest Ads Cost? The cost of your Pinterest ads will vary depending on the type of ad campaign you’re running and the audience you’re targeting. Regardless of the type of ad you’re running, you’ll be asked to enter the maximum bid you’re willing to pay to have your objective achieved (clicks, engagement, or impressions). Traffic Ads: Maximum CPC (cost-per-click) – the most you’re willing to pay for a click to your website. Brand awareness and video views: Maximum CPM (cost-per-thousand impressions) – the most you’re willing to pay for 1,000 impressions of your Pin or video. App install: Target CPI (cost-per-install) – what you’re willing to pay for each app install. Pinterest will provide you with a suggested strong bid, but you can bid more or less than the suggested strong bid. Pinterest will continue to provide you with guidance (such as good bid, low bid, too low, etc.) based on the bid you enter. In my experience, the suggested strong bid that Pinterest generates produces great results and I’ve never paid the maximum amount. I’m currently running a traffic ad campaign with a Maximum CPC bid of 26 cents and I’m actually paying an average of 12 cents per click. With that said, don’t enter a maximum bid that’s more than you’re willing to pay for the desired action. Now that you have a basic understanding of how Pinterest ads work and how they’re structured, I want to share five best practices to follow when building your own Pinterest ads. The Pinterest tag is a piece of unique code you generate within your ads manager and install on your website. The Pinterest tag is important for two reasons. First, it allows you to build audiences you can retarget later. For example, you can deliver your Pinterest ads to people who have visited your website in the last 30 days. The other reason the Pinterest tag is important is that it allows you to track specific actions that occur on your site, such as signing up to your email list. 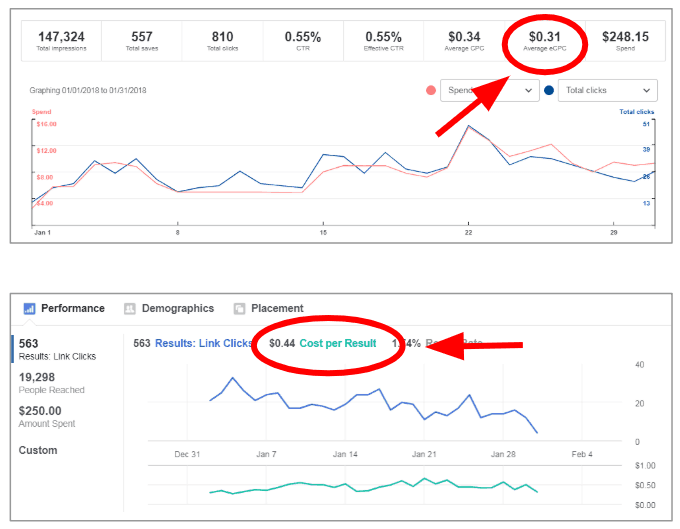 As long as you have the Pinterest tag properly installed on your website, you can track how your ads are converting within the analytics of your campaign. The 3-level structure of Pinterest ad campaigns allows you to build out multiple ad groups within one campaign. Many people will create separate ad groups for cold and warm audiences, but I recommend segmenting your cold and warm audiences into completely separate campaigns. The placement of your ads is selected at the Campaign level. This means ALL of your ad groups within that campaign must be either Browse ads, Search ads, or both. Even though Pinterest recommends you select both Browse and Search for placement, I have experienced better results by separating them out into different campaigns. Read the next two best practices to fully understand why it’s important to segment them out. Search ads are shown in the search results after someone types in the search bar something specific they’re looking for. See the image below for an example of how search ads work. I typed “red rain boots” into the search bar and Pinterest produced a mixture of organic and paid Pins in the search results. Remember, the Promoted Pins (paid ads) are indicated by the “Promoted by (company name)” text at the bottom of the Pin. Search ads are an outstanding way to get your products or services in front of people actively searching for what you have to offer. What’s more, Search ads are a great way to expose your business to people who have never heard of you before, i.e. cold audiences. Warm audiences are people who are already aware of you or your company. In my experience, warm audiences work well with Browse ads because they’re familiar with your name or your brand image. When someone is scrolling through their home feed, they are much more likely to take the desired action of your Promoted Pin (clicks, engagements, or impressions) if they’ve engaged with your company before. Running Browse ads only to warm audiences brings the cost for your desired action down and increases the number of conversions. It’s important to have patience when running Pinterest ads. Once your ad has been live for a day, it can be tempting to start making changes in an effort to improve the performance of your ad. However, it’s important to let your ad run for 5 – 7 days before you start making changes. The Pinterest algorithm needs time to work its magic to get you the best results for your budget. Take a look at the example below from one of my Pinterest ad campaigns. As you can see in the graph, it took a full five days before Pinterest started spending my entire $5 per day budget. Then, it took another four days for the algorithm to find me the lowest CPC. If I would have made changes to the ad after 2 days I might never have reached the sweet spot of consistent traffic at 11 cents a click! Now that you understand how Pinterest ads work and you have a few best practices to follow, it’s time to create your first Pinterest ad campaign! This will open up the campaign level where you will select your campaign objective and you can start building your campaign. If you would like more hands-on support for building your first campaign, I would love to have you join my Pinterest Traffic Trifecta course. You’ll learn how to create custom audiences, how to structure your ad campaigns, and I’ll walk you through, step-by-step, exactly how to build your first cold and warm ad campaigns. You’ll also get a cheat sheet outlining exactly how to build your Promoted Pin campaigns for optimal results and minimal cost. 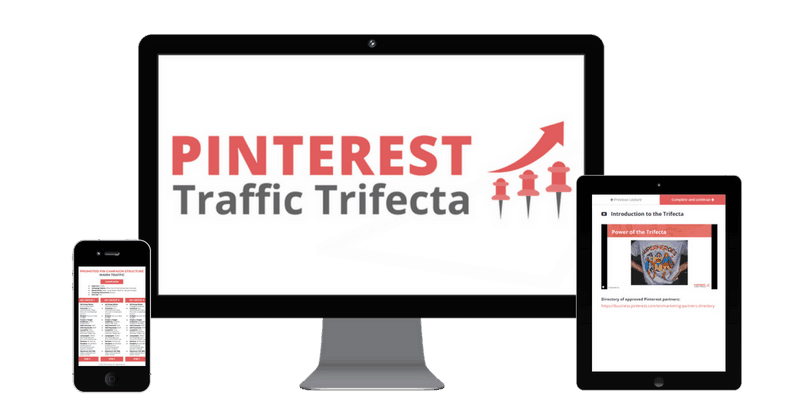 To learn more about the Pinterest Traffic Trifecta course, click here. If you’re not the do-it-yourself type or you don’t have time to add one more thing to your never-ending list of to-dos for your business, you can hire a Pinterest ads manager. In fact, you can hire me to run your Pinterest ads for you! I’ll help you develop a solid strategy to deliver high-quality traffic and leads to your business that won’t cost you a fortune. To schedule a free Pinterest Ads management consultation so I can learn more about your business and we can to see if we’re a good fit, click here to send me a message via my contact form. 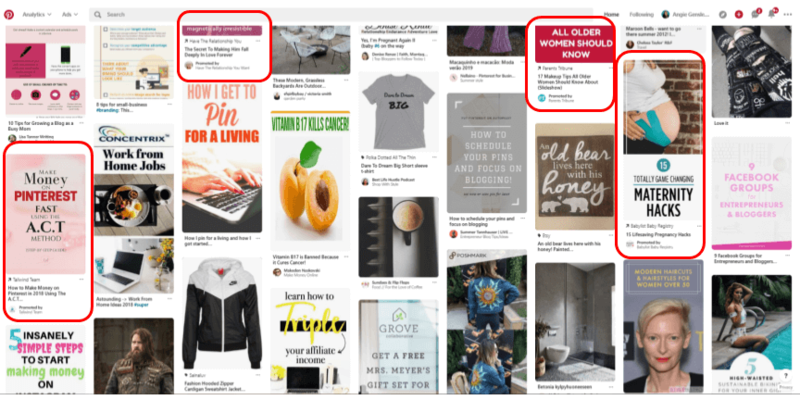 If your ideal customer hangs out on Pinterest, Promoted Pins (Pinterest ads) are a great way to reach them early in their buying decision process. Whether you take a course and DIY your Pinterest ads or you hire a Pinterest ads manager, Pinterest ads can have a huge impact on the traffic, leads, and sales generated for your business. Have more lingering questions about Pinterest ads?